Maulana began by reminding us about a simple and known fact that is always forgotten – we must obey our Creator, Allah Almighty. If we don’t, we will face a series of never-ending problems, that will grow in severity, in this world and in the hereafter. Life will be filled with burdens, and every new problem will be like a spear piercing us without warning, adding to our difficulties. We must bring that same message to everyone we meet – call Mankind to become obedient servants of Allah! If you cannot please Allah, then your life in this world and the next, will be miserable and filled with suffering, you will never attain peace, pleasure or felicity. Disobedient ones will fall into the Valley of Trouble and Despair in this life, just as they will fall into the Valley of Fire in the hereafter. Don’t you want to enjoy the sweet life in both worlds? Allah did not create you, except for that. Taste the sweetness of being created, the happiness, love and pleasure culminating in an eternal existence in Paradise. Why are you rejecting this, and choosing a meaningless, tasteless, numb existence saddled with disappointment and despair? Man today is drunk throughout the twenty-four hours of each day, he is seeking to find pleasure and meaning in this life, and he is so desperate to taste that pleasure, but he can’t taste anything. He eats…but it is tasteless. He drinks….but it is tasteless. He socializes….but it is tasteless. He sleeps….even his sleep is tasteless! Maulana says, today’s aimless humans can’t even sleep naturally anymore, so many people need sleeping pills and other drugs, just to fall asleep! Oh humans, what has become of you, that you cannot even fall asleep in peace? How troubled their Souls must be, that they cannot find any taste in living! One whose heart is at peace, can eat dry bread with salt, and he will find it a fulfilling and tasteful meal. And he can sleep in the open with a rock as his pillow, and he will be a picture of tranquility and contentment. One whose heart is aimless and restless, even if he is sleeping on a thick and comfortable mattress, still needs medicine to induce sleep. Those sleeping with the help of drugs, are sleeping the sleep of death, like a dead one. Sleep contains a form of Spiritual rest, that is a grant from Paradise, and as believers fall asleep, their Souls are taken by Angels. The sleep of Believers and Lovers of Allah and His Prophet (saw), is a sweet one, and their waking moments are equally sweet. To the rest of Mankind, everything is tasteless. Taste comes from Spirituality, not from the material/physical world, but so many do not understand, and they are looking for life’s sweetness, in all the wrong places. Maulana spoke on the deception posed by technology. On the surface, it seems like a wonderful thing, as it makes life so much easier – everything is fast, easy and automated. Communication, travelling, farming, medicine have all been transformed drastically by technology. In the old days, Maulana said, workers worked slowly, doing Zikrullah, while the Angels joined them in the remembrance. There was pleasure in the air, unlike today, when the air is polluted with poisonous fumes and noxious discharges. But what has happened to Man with this technology? He has become a creature who has faith only in the material world, and he has forsaken his Spirituality. That has dire consequences, as peace, happiness and all other pleasurable experiences, reside in our Spiritualities, not in our physical bodies, and it is attained by Spiritual practices, not by physical stimulation. The end result? Today’s Man, is devoid of Spirituality and Faith, and is desperately unhappy (but doesn’t know why), he is yearning for rest (but can’t find it) and he is drowning himself in this worldly life, hoping to become numb and detached from his hopelessness and emptiness. What a bleak picture. Technology is killing your Spirituality! Return to nature! Lead a natural way of life, go back to natural surroundings and the good old ways things used to be done. Leave technologia and come back to nature! The key to a sweet life in dunia and Praradise in the hereafter, lies there. Why? The Kingdom of shaitan is built on technology, we must join hands (unite) to destroy that kingdom, for shaitan is our common enemy. All men are brothers. As such, we must behave as brothers to one another. Every tribe/nationality is created unique, with special good characteristics. When we unite, we complement each other. Each tribe/nationality is like a different flower. 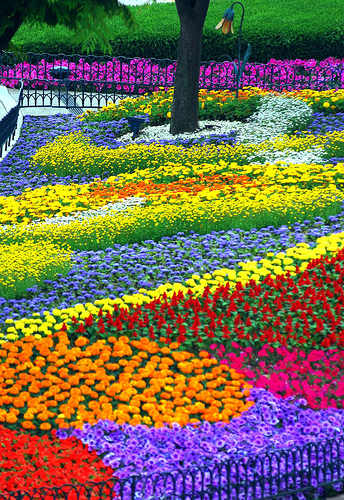 When united, they forms a resplendent garden with a staggering array of stunning flowers of unique shapes, colours, fragrances and sizes – like a rainbow of many colours. Maulana asks, have you ever seen flowers fighting? Obviously not, so humans should not be in conflict, they should be in cohesion! Why is Man fighting and killing? There is no honour in that. How is it that Man claims he has reached the peak of humanity and human rights in these times? What a blatant lie! Today’s missiles and weapons of mass destruction, are not only designed to kill, but also to kill in the most painful and inhumane way (eg phosphorus bombs, biological warfare etc) and they not only kill and maim humans, they have no regard or concern for the plants or animals either! Is this a ‘civilised’ people that burns each other to death as cruelly as possible? Maulana warns, Allah will send a ‘Divine cleansing’ to the earth soon, to weed out those hell-bent on cruel violence and destruction. Every diabolical one will be crushed, and this earth will then become a Garden where the weeds will be killed, but the flowers will remain! It is a simple and logical fact; Allah created us, and we are His creation. We must know our place as servants, acknowledge Him as our Lord, and obey without the slightest defiance. Strangely, in this end of times, such advice is unwelcome and thought of as irrelevant, even as illogical, by some. In this single Ayat, Allah shows all of humanity the futility of their efforts. They can never find peace in sin! They can only find peace in obedience and remembrance. There is no other way. Not one human being from the billions who have died and who are still living, has ever found success, victory or safety, without believing in Allah, and serving him as a true and humble servant. Not one. Be like flowers in a Garden (of Paradise)! Flowers smell good – so put on your best behaviour towards your brothers. Flowers don’t fight – so be a true Muslim, like what is said in a hadees, “A Muslim is one from whom you are safe from his tongue (words) and hands (actions).” By that definition, so few of us are real Muslims! Flowers complement each other – so work hand in hand and help one another. Repent and change your ways, for you must know that the ‘Divine cleansing’ is not a random event. Just as the birds of Ababil carried rocks from Jahannam to kill the elephants of Abrahah (when he was marching with his elephant army to destroy the Ka’aba), and every rock the birds carried had the name of its intended target, the Divine chastisement coming, is a precise and deadly event. If your name is written on one of the ‘rocks of Jahannam’ that is coming, it will seek you out, even if you hide in the deepest bunkers behind the thickest walls! If a text message sent to your mobile phone, can ‘find’ you anywhere on earth, surely Allah’s Angels will bring the Divine Retribution, right to your face, no matter where you hide. Realise that safety lies not in building more weapons or hiding in more remote places. It lies in repenting, changing your ways, and being obedient to Him. Time is running out…. If you would like to listen to the actual Suhbah by Maulana Shaykh Nazim when it was recorded, please click here. Once at the site, please click on the Sohbat 15 Oct 2010. Maulana Shaykh Nazim teaches daily, at 1720 hours GMT, please go to www.Saltanat.org to attend these illuminating lessons. There are no charges to attend these lessons, they are completely free-of-charge. These transcripts and Study materials are found at the Singapore Naqshbandi portal, www.SufiHub.com, these are also completely free-of-charge. This entry was posted in Maulana Shaykh Nazim's Suhbahs and tagged Armageddon, brotherhood, nature, technology. Bookmark the permalink. Someone had asked, how do we return to nature, as suggested by Maulana. 1. Instead of having fake/plastic flowers in your home, go buy some real flowers! Look at Maulana Shaykh Nazim during his Live broadcasts. In almost every broadcast, Maulana has some live roses, in a vase, somewhere in the room. It is quite obvious, on the pedestal on his right. Living creatures are in continuous praising of Allah, as Allah said in the Quran, “Every creature is praising Allah,” so the mercy and blessings descending on these living creatures as they recite tasbih, bring tranquility to us too. In a famous hadeees, Rasulullah (saw) was walking near two graves, when he stopped, took two live branches of leaves, placed them on the graves, and walked away. When asked by his Companions, why he had done so, he replied, “These two people are being punished in the graves over acts that we view as very light (petty). One is being punished for back-biting, the other for improper cleansing of himself, after urination. I placed these leaves here, so that Allah may reduce His punishments upon them, as long as they have not dried up.” So the live plants, doing zikir, is a source of mercy descending from Allah over the inhabitants of the grave, and that continues until they die. This hadees teaches us so much – the need to clean up thoroughly after easing ourselves, as well as the need to eliminate back-biting from our daily routine. It also shows us that live plants bring mercy, so do place live flowers in your homes, and on your graves, as a source of mercy. Areas devoid of mercy, will have no living things there. If you go to Badr, the area where the enemy soldiers stood while fighting Rasulullah (saw), is devoid of plants, even to this day! In contrast, where Rasulullah (saw) and the Companions stood, flourish huge date trees. On a similar vein, have real fruits in your home, instead of decorative plastic ones! Real fruits are alive, they zikir. They are also natural food, so you can eat them when you are hungry. So get rid of the plastic flowers and fruits from your home! 2. Eat and drink natural stuff. Instead of a Big mac, BBQ your own burger. Eat fresh fruits. Instead of fizzy drinks, drink lots of juices and plain water. 3. Breathe fresh air. Go to the countryside, admire Allah’s artistry and remember Him. 4. Call and speak personally with people, whenever possible, instead of the impersonal email/text message. Good old face to face interaction is always the best way to build bonds and bridges. See how politicians always start their meet-the-constituents before elections? A personal meeting carries more charisma, than any email, or text message that you can send. So especially for loved ones, make the effort to meet and share the love. After all, when they are gone, you will regret the fact that you hadn’t really spent time with them. 5. Reduce dependence on medication, try natural cures. Shaykh Nazim has actually published a book on natural cures. Taking milk, honey, habbatus sauda, dates and apple cider vinegar, are all natural and powerful health enhancers. Avoid popping pills at every slight illness. Massage, cupping, exercise, fasting are all better ways of curing illnesses. The humble Onion carries so many secret cures, it is used to cure cancer, says Sh Nazim! 6. Take a walk after meals, instead of always driving around. Exercise, with Zikir, helps keep the circulation going. There are many more….insyaAllah will post in future.